Minor quibble: no one ever actually attaches anything. But that’s really my only quibble, so you know this book is damn solid. Okay second quibble. What Lincoln does is really creepy and inexcusable and when Beth does finally get to confront him she makes a (mean) joke and then immediately apologizes which … I mean, yeah, that’s how we women are raised. It makes sense and it makes me mad. Anyway, I, like most of you, adore this book. It takes a phenomenally creepy and invasive premise and turns it sweet, somehow. Rowell sold her soul somewhere because it shouldn’t be possible and yet it works. Lincoln is spying on her and yet we root for them! He doesn’t mean to, he feels conflicted, he wants to stop, but he doesn’t, he doesn’t until he’s gone way too far and learned way too much and ugh. And her creeping on him doesn’t even the scales, not by a long shot. But Rowell works her magic and here we are. The characters are gorgeous. Even Chris, besides being physically gorgeous, is understandable. You get where he’s coming from even if you don’t agree with him. Rereading this makes me want to reread all the others and the beauty of Rowell’s books is that that is always an option. Keep writing, woman, you are amazing. 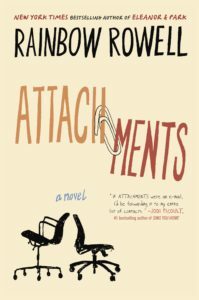 Share the post "Rainbow Rowell is an evil genius"
I’m convinced she gets away with it because she makes us as readers complicit in his creepery. We want him to keep reading the emails because *we* want to keep reading them. I think that’s it. That and watching him grow as a person are what save him. you two smarties are very smart and I think you’ve unlocked the Lincoln conundrum. Everyone here is smart and lovely. It’s so great. Also I just in general think that everyone is secretly more creepy than they want anyone to know about. I think you are 3 reviews away from a full bingo card. That’s what my card says! The center square is the only one my library couldn’t hook me up with, so I just ordered a copy.